At this point Justin Grimm is technically still a competitor for the fifth spot in the Cubs rotation. However the Chicago Cubs are determined to bring in more rotation depth that would push Justin Grimm to the bullpen. Grimm has also been mentioned as a potential closer if the club fails to acquire a more established candidate. Pedro Strop and Hector Rondon would also be considerations in that role. All three three have the power arms that most clubs prefer in the ninth inning. Grimm has had mostly mediocre results as a starter but has solid command of a mid-90's fastball and a potentially plus curveball. His work ethic has been praised and he could still develop into a solid mid-rotation option. Still, as is to expected, Grimm has looked very good as a reliever in small samples. 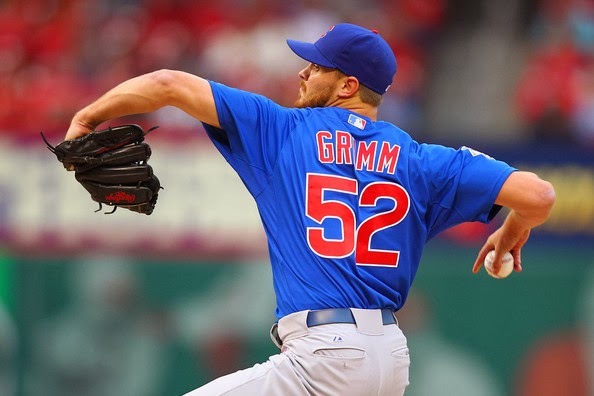 With very few options on the current roster and the Cubs considering the Axford's of the world as possibilities, Grimm has great sleeper potential as a closer. That is NOT a photo of justin grimm. Thats what I get for trying to rush through a post before work. Thanks.